Carrot Cake with cream cheese frosting moist and delicious carrot cake a Special recipe from Cake 2 Thailand ® Presented in a beautiful gift box. Sure to be impressed. Free delivery in Bangkok and surrounding area. Same day delivery now available. Place your order by 6pm. (US Time Zone) or 12pm. (UK Time Zone). Your cake will be delivered the same day or within 2-4 hours. Substitution may be applied. - Only the finest quality chocolate imported from Belgium is used to create this incredible cake. 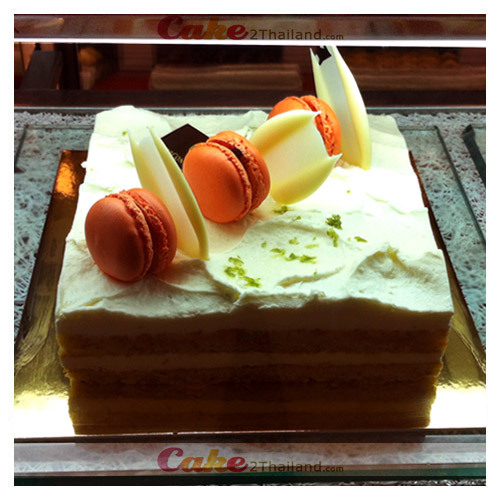 - This Cake is Only delivery in Bangkok. - Please order 1 day in advance. - Free gift card with personal message. - Free! a box of candle & plastic cake knife. depending on availability and season.